Road Trail Run: Nike Zoom Vomero 14 Review: Fast and Responsive Heavy Duty Run Trainer! 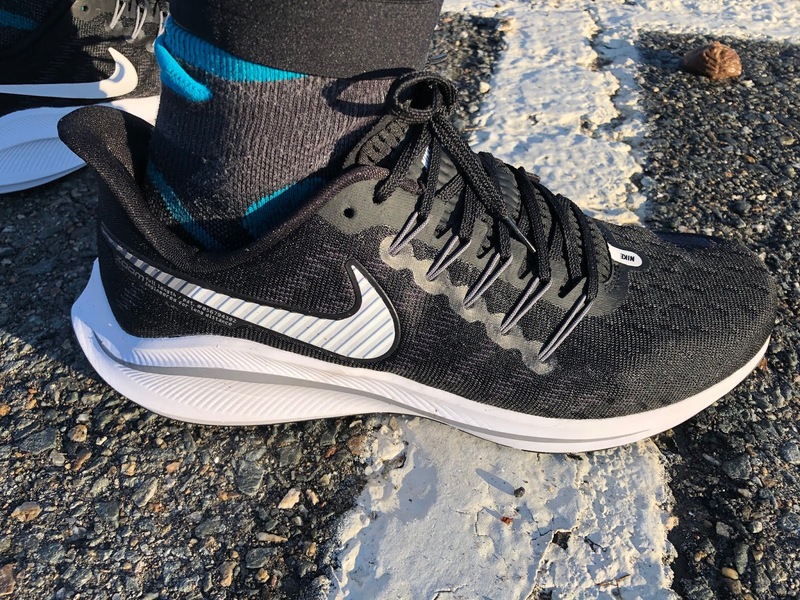 Nike Zoom Vomero 14 Review: Fast and Responsive Heavy Duty Run Trainer! The Vomero was a personal purchase at retail. The Zoom Vomero 14 is an entirely new run trainer from Nike. It only shares name, Zoom Air and the exact same weight with its predecessors. There is no question from my initial testing that the Vomero is designed to be Nike's new heavy duty faster, long and big mileage trainer. It is by far my favorite Nike heavy duty trainer in many years. The Zoom Air is in a new full length patented configuration embedded in Nike's React foam. It is my understanding the Zoom Air unit swoops down in a curve similar to the Vaporlfly and Zoom Fly but here we have air instead of carbon for the plate. At a reasonable shade under 10 oz (283 g) it is heavier than the Pegasus 35 (RTR review) and Turbo (RTR review) as well as Zoom Fly Flyknit (RTR review) and Epic React (RTR review). Not to worry it is a very dynamic riding shoe with a particularly well executed thinner, stable, firmer, yet well cushioned forefoot that likes to go fast and lively. My ground contact times as measured by RunScribe are close to the Vaporfly in the Vomero 14 which means I am turning over fast, always a good thing. 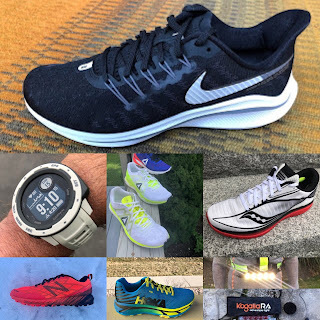 Looking more closely at the stack heights we see the Vomero has a lower stack height at 27mm/17mm than its predecessor which was 31mm/21mm and is 1mm lower heel and forefoot than the Pegasus 35. The Vomero 14 fits me true to size with a fit a touch more relaxed than Pegasus 35 upfront due to the less dense more pliable mesh there which creates slightly more overhead room. The top of the achilles swept back tab is less noticed in the Vomero than Pegasus. It is also slightly more relaxed in fit up front than the Vomero 12. It is of course a different fit than the more performance oriented Zoom Fly FK with its Flyknit stretch knit or the very snug at the arch and mid foot for me Epic React. No such Epic React issues for me here. The upper is a comfortable engineered mesh with Flywire. The Flywire cords extend further down the outside of upper before entering and proceeding to the midsole which I assume is to provide a touch more padding from the outer mesh and to better wrap the foot in concert with the laces. It is more mesh like than the more knit like Peg 35 and certainly less plasticky than the Peg Turbo's upper, There is plenty of toe box room but this is not a wide toe box, and as with the Peg 35 and Zoom Fly Flyknit, I found not lacing overly tight relieves any front of the laces pressures from the FlyWire. The ankle and achilles collar is very firmly, modularly padded and stiff but holds the rear extremely well. 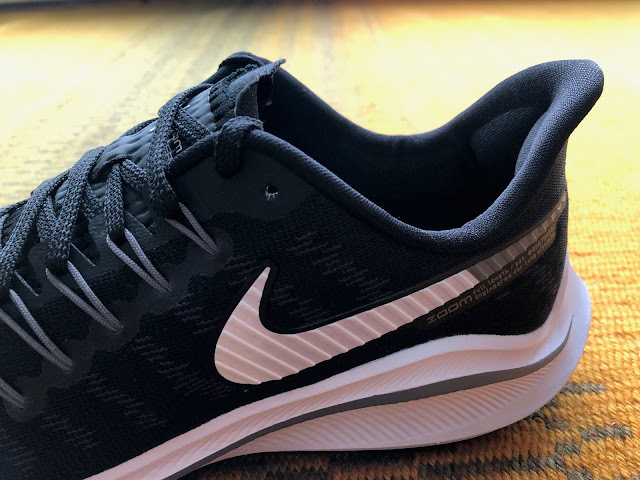 Unlike the thicker Pegasus 35 or puffy Vomero 12 the tongue is thin and lightly if adequately padded if a bit short in length. It ties into a bootie which sits between the foot and lower entry of the Flywire. The swept back achilles "thing" holds the achilles well with no top of achilles pressure or heel slip. The resulting foot wrap is perfect: secure, snug, with no slop but more on the performance than relaxed side of uppers. The midsole and geometry is completely new with React foam as the main cushioning, a new full length Zoom Air unit instead of separate front and rear units, high rear sidewalls, and a deep underfoot decoupling and weight reducing groove. The stack certainly feels and according to Running Warehouse is lower with Vomero 14 at 27mm heel / 17 mm forefoot while the Vomero 13 is shown as 31 mm heel / 21 mm forefoot. We will confirm as the 14 may not include the height of the sock liner. The side walls wrap the front of the heel cup. The high rear side walls are partly cosmetic as they cover the heel cup to the rear but do extend a bit further forward than the heel cup normally does. The sidewalls provide a very light stability element to the shoe following a recent trend towards guide rails and such. I do notice them and those with wide flat feet may notice them more than I do. I notice the side walls and a slight sense of heel blockiness more at slower paces than fast. At faster paces they clearly effectively direct the foot in the path of travel and disappear. The deep decoupling groove is oriented to end way over on the lateral side upfront providing a wide platform of support. 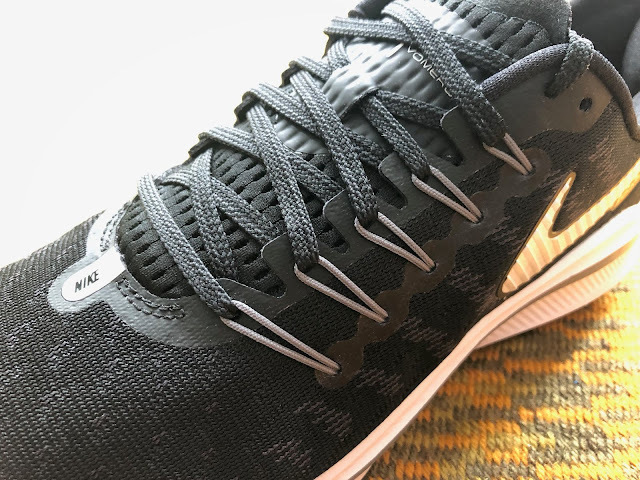 Based on what I learned from Salomon's Sonic RA line decoupling designs, such an arrangement provides more medial forefoot support and stability. I could sure feel this on the run as the toe offs were decisive and very stable as well. Unlike the Salomon Sonic RA Max, their most accentuated medial platform design, the transitions, due to the deeper groove I believe felt far smoother in the Vomero. 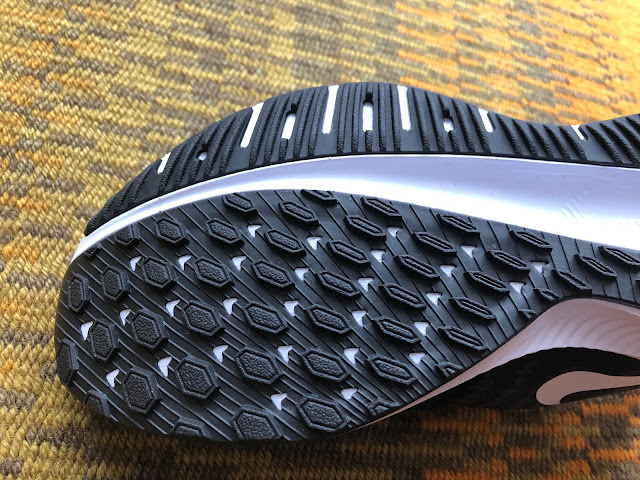 Bottom line the Vomero 14 has some inherent forefoot stability I think contributing to balancing (with the Zoom Air in the mix for cushion) the performance snap from its distinct flex point and great road feel, and relative lack of forefoot shock or fatigue of a relatively thin forefoot. The ride is on the firmer side but very well cushioned. 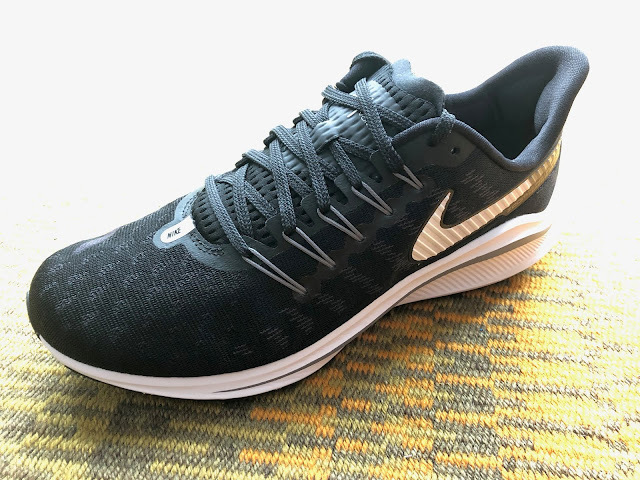 The combination of Zoom Air which provides both stability and firm cushion and the softer React foam makes for a very balanced ride and overall feel: highly responsive, stable, with none of the muted dull cushion React alone tends to have in the React. 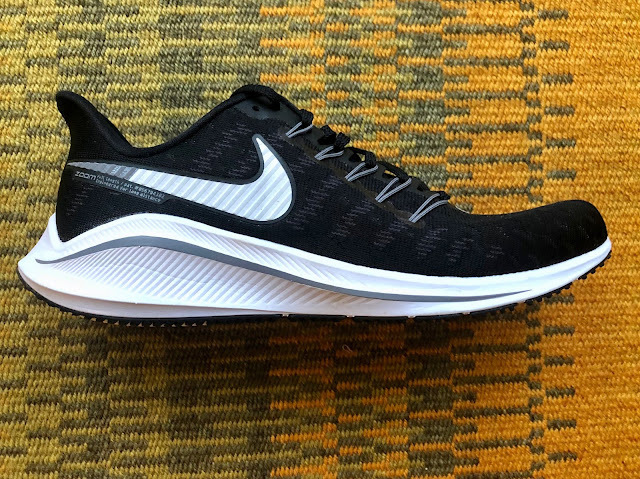 More muted in response but a touch more forgiving than the new Zoom Fly Fly Knit, the ride here is for long fast miles. 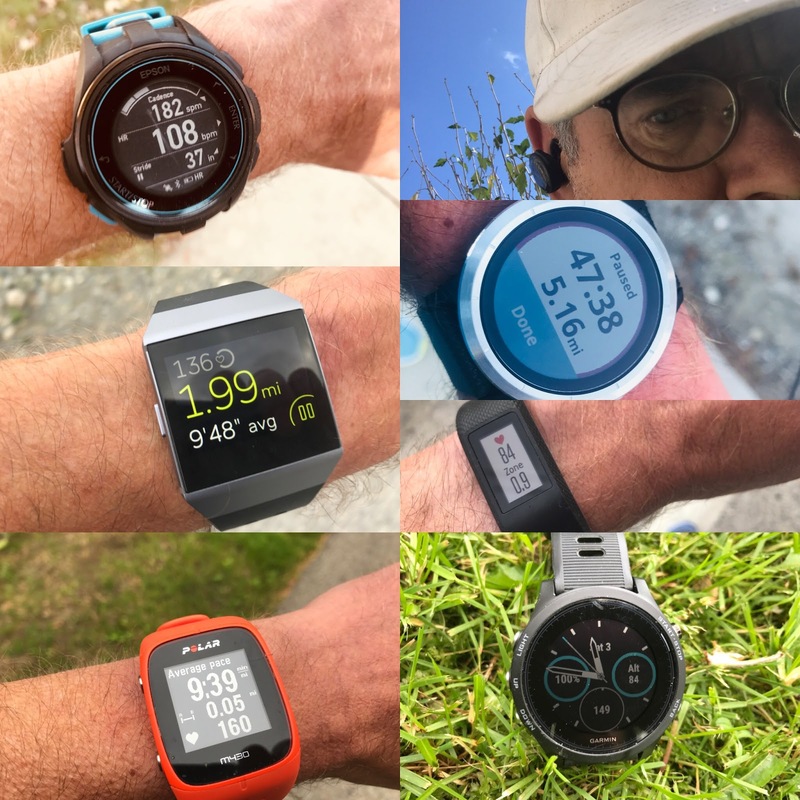 The transitions and toe off at tempo paces is smooth and snappy (my ground contact times prove this) with great front ground feel and minimal shock. At slower paces, the heel width and the side walls are more noticed so I might not first select the Vomero as a recovery easy days shoe and in the class would lean more towards the New Balance 1080v9, Peg Turbo, Skechers Ride 7, or Brooks Ghost. Update: I ran the Vomero 14 on mostly hard packed snow with some road and they were sensational. With the exception of a touch of very front slip on steeper climbs they otherwise had great grip and the flexibility had me climbing easily. 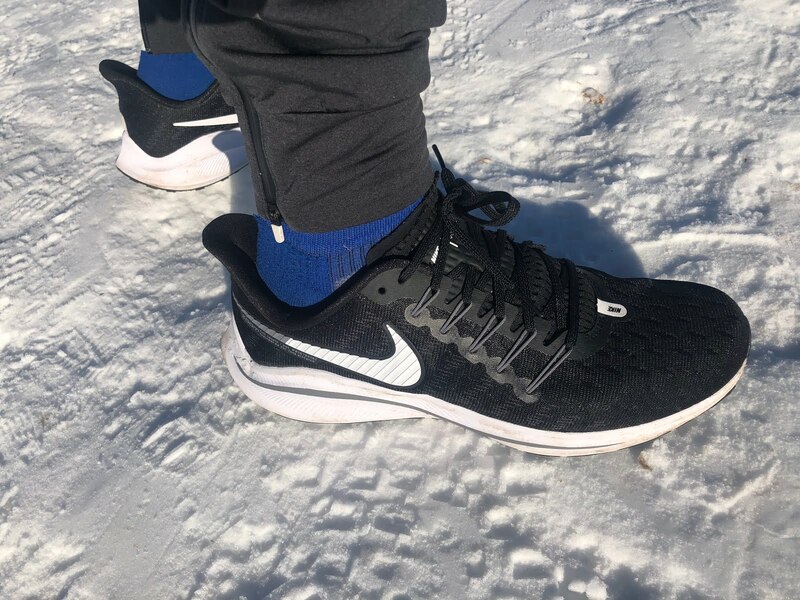 In colder weather today at 28 F -2 C I note the React and/or the Zoom Air firms up some on pavement, a characteristic I also noted in the Epic React last winter. The overall execution bridges performance and training, while for sure leaning more to training and more completely balancing speed and protection than any of its siblings, or in fact other shoes in its class such as the Ghost, Launch, Skechers Ride 7, and Sweet Road 2. 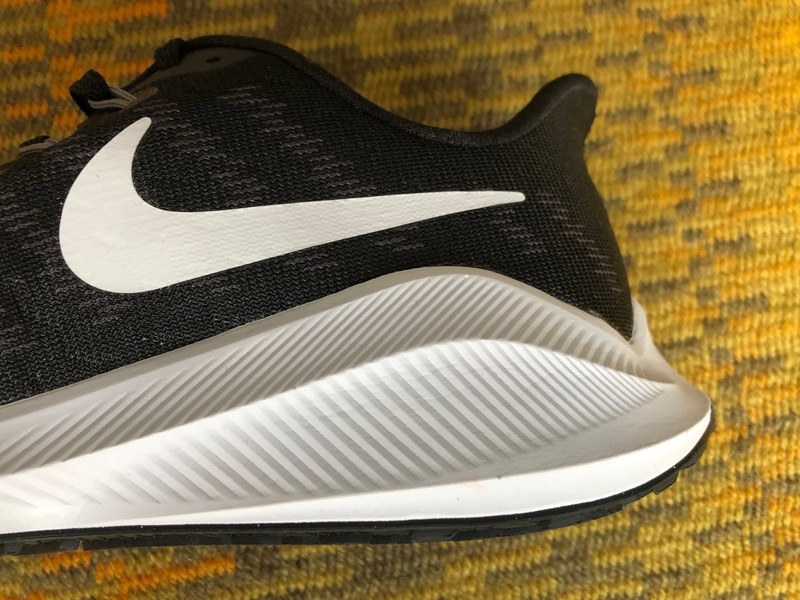 In the Nike scheme of things for me it replaces the Pegasus 35, a shoe I found blocky and lumpy if responsive, and the softer not particularly fast predecessor Vomero 12, the last version I ran. With its light inherent stability front and back without posts or plates it may also replace the Zoom Structure a shoe I have not tested. It clearly becomes the heavy miles daily training companion to the fast days Zoom Fly Flyknit and race days Vaporfly given its low agile forefoot and solid cushion. I bet the heavy mileage Nike elites wanted this shoe for daily training. A long lasting training shoe which protects and helps me run fast with a firmer stable forefoot and dynamic neutral ride is what I prefer. I deduct a small amount for the somewhat exaggerated rear midsole walls which while functional could be reduced along with weight and for firming of the midsole in colder temperatures. This is the closest obvious comparison is to the. It has a similar fitting upper. Choose the New Balance is you want a softer more relaxed ride and one suited to easy days, but still a lively one. Choose the Vomero, hands down if you want a higher performance faster training ride. The Triumph is one of the big surprises of 2018. It runs far smoother than its predecessors and "lighter" than is weight. It weights a considerable 1.5 oz more weight than the Vomero but has a quite lively more forgiving ride. It is a softer more cushioned shoe with a more relaxed ride than Vomero from its combination of slightly bouncy Everun, more forefoot stack and a softer outsole. The upper is roomier. I prefer the greater energy of the Vomero for most runs. The Ride 7 is lighter by 0.75 oz and springier than the Vomero. While the Vomero is notably stable in the forefoot the Ride 7 is not. The forefoot performance of the Ride is more towards cushion and a rocker while Vomero leans towards performance through the deep decoupling groove and flex point. Heel cushion is quite similar although here to the Vomero is more stable and denser. Ride 7 has considerably less outsole rubber and a similarly fitting upper. The choice comes down to a more stable very fast ride with lots of durablity with Vomero vs. a springier lighter one with Ride 7. Considerably less money on sales you can probably pick up two for the price of one Vomero and you will likely need to to match miles.My preference is the Vomero 14. The product reviewed in this article was a personal purchase at retail. The opinions herein are entirely the authors'. SHOP RUNNING WAREHOUSE FOR NIKE ZOOM VOMERO 14! Hi Anonymous, the comparison to NB 1080v9 is above in brief. Pretty much sums it up but will be expanding on it. Very similar all around with 1080 softer and while a fine all paces trainer easier going less dynamic and responsive especially upfront for me than Vomero. If its lower and for some looser heel fit works for you its upper is a touch more relaxed and more comfortable. Thanks for your reply Sam. Your 9.99 score definitely encourage me to give it a try once it is available. Thanks. Im looking for a treadmill running shoe. I will be doing sprints, jogging and walking on the treadmill. Front of my feet are wider than the back. For reference the Brooks Ghost 11 in 2e fit me fine. Im looking for something cheap and good. Is the NB 1400v6 2e good for treadmill use? I too noticed the 9.9 rating. And, that got me thinking. You should consider dropping for us a spread sheet (or a similar graphic) with all of your reviews for 2018 in one spot. Obviously, this would just be quick, at-a-glance info, that would then link to your primary review. link to review & link to purchase. In a perfect world, a reader could click on the column heading and it would adjust (example - so we could sort by price, etc.). But, if that's not possible, just having them all listed highest to lowest Sam review score would be really cool. Thanks for all your work and good luck at the year end show store expos. Thanks for the great suggestion. I am hoping to do something along these lines in the next month or so. Each reviewer's score is their own view so we would need to include scores for each reviewer for the shoe. Hey Sam, Another idea that I've been thinking about. I think it would be awesome if you did a shoe of the year article as we're heading towards the end of the 2018. I know you named the Hupana your shoe of the year a couple of years back. It seems like the Floatride Run Fast, the Vaporfly, and maybe the Beacon have stood out to you this year? I think Peter has said the Ride 7 is at the top of his list. I think Dave has loved the Kinvara 9. I know you have some new reviewers too. I would love an article where you all award your shoe of the year and give your reasons. Just a thought. Haven't been able to run in any heat but the upper should be plenty breathable, potentially more breathable than Ride 7 as it is less 3D in nature. This said it is a fairly dense but thin and pliable upper. I would say the Triumph ISO 5 with more holes through may be more breathable. The midsole is firmer than Epic React but I would say in the end equally well cushioned, just a different feel. I find the Epic React's overall cushion dull. Here with Zoom Air plus a real and responsive outsole the shoe has life. 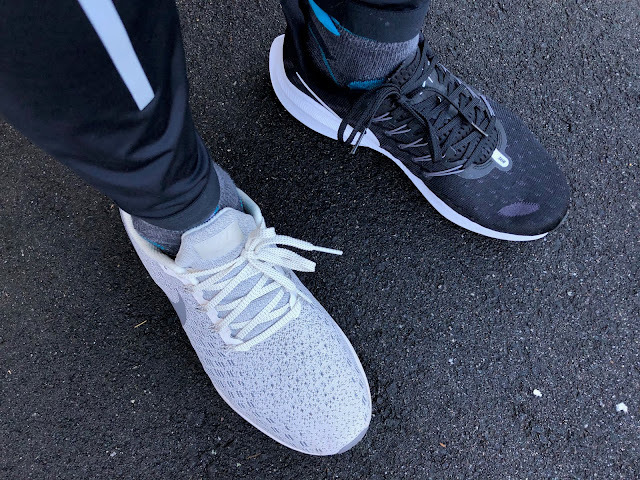 Definitely an everyday trainer, one that leans towards faster paces, I would not pick it first for a recovery shoe and would lean more towards the NB 1080v9 for a softer all around ride but not quite as dynamic one. Not sure if others will be able to get pairs of Vomero at this point. Vomero 14 (React + Zoom Air), ZoomFly Flyknit (React + Carbon Plate) or EpicReact (only React)? Very intriguing, "My preference is the Vomero 14" vs Ride 7. I very much enjoy 7s, but as you said: "considerably less money on sales you can probably pick up two for the price of one Vomero" — make sense 2x7=14 ;-) I'll wait when the price drops a bit. Thanks for another great review! I believe 27/17 is the correct stack height for two reasons: Nike likely does not include sockliner and for sure they do not feel like a 22/12 stack shoe, for sure more cushioned than that! The forefoot is firmer than earlier Vomero but as said in the review this is a more performance oriented heavy duty trainer up front yes you do feel the ground but not much shock( a very clever design IMO) , far more agile faster upfront than earlier Vomero(soft and stiff( or Pegasus (firm and stiff) for me. Rear cushion is similar to Vomero 12 maybe a touch more cushioned than Peg 35. I would not call V14 forefoot a plush recovery feel but there is plenty of cushion it is just low profile in nature. Hi Gene, Thanks for kind words! We'll keep at it. As far as last my sense is that it is the same but of course the upper construction plays a huge role in fit as well. Why don't other brands fit you? It is a good question and I will see if someone on the Running Shoe Geeks on FB might know the answer. I only tried them on in stores, but I can wear, and run in the Saucony Ride ISO but like the Ride 10 they are just a little short compared to a Nike, same for the Cumulus 20 (which is too firm anyway cf. to past versions- which had lasts similar to current Nikes). Adidas fits seem to change all the time, but for Adidas it could well be their uppers. The Ghost 11 is comfortable but Brooks don't match my feet like Nikes. It was a while since I tried on the Ride ISO but on further thought saying it fits short is not accurate (the Ride 10, which I have, feels short). I remember clearly now that the Ride ISO is wide and loose in the midfoot & arch, with no real arch support. This could be the upper problem which you have commented on many times in your reviews. Thanks for your further comments which I agree with. Ride ISO is overly loose in the upper particularly at mid foot. I just bought the Vomero 14 thanks to your review. Enjoy! I preferred it’s stable flexible midfoot. Let us know how they go for you. Hi Sam, would you recommend it for heavy supinators? By heavy supinator do you mean you land on the outside of the foot at the heel and forward? What shoes have worked for you in the past and which not so good which may help me better answer. Actually on the outside of the foot at the heel and back. I'm currently running with vomero 13 or pegasus 34. The former is far better but I was wondering if the vomero 14 is closer to pegasus (based on its photo I mean) than to its known vomero profile. I think you covered me with your last clarifications. Just some remarks about this shoe: I come from a lot of Boost shoes which I preferred over the EVA shoes of most brands. I like the underfoot feeling of the 14 with react + air a lot. The shoe is a little long, but the forefoot is still very good, not to high or low, so true to size. Heellock was not that good initially but by changing the (rather thick) insole for a used / thinner one it improved. That also eliminated the 'big drop' feeling. I can see me running a full marathon on these: fast enough and cushioned as well. Thanks for your feedback on Vomero 14 and the insole tip. I found during my initial runs the heel lock wasn't quite perfect but after a few runs after the insole packed down a bit the hold improved. Hi. Just curious about the fit for this pair. I use a sz10 for my pegasus 33 but when i used 10.5 for my pegasus 35 it still fits too snug in the midfoot area because of my wide feet. 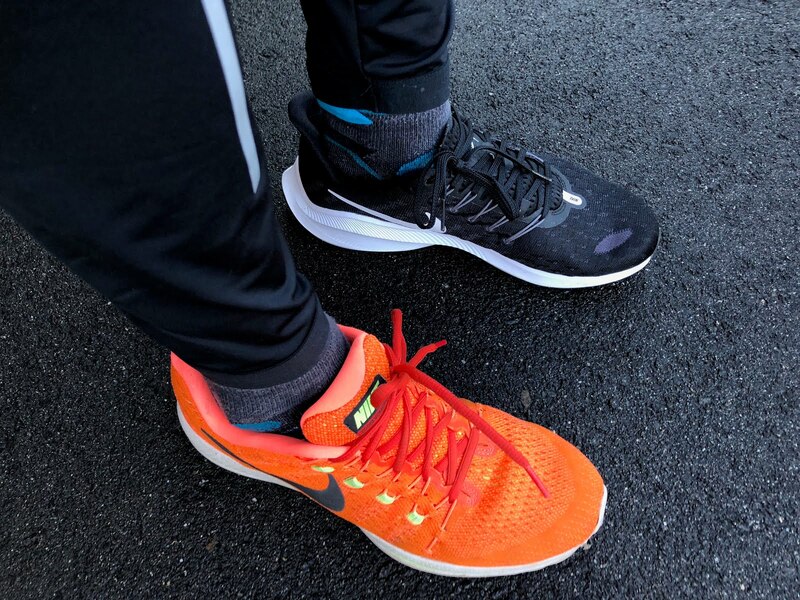 Is the fit for the vomero same as the pegasus 35? 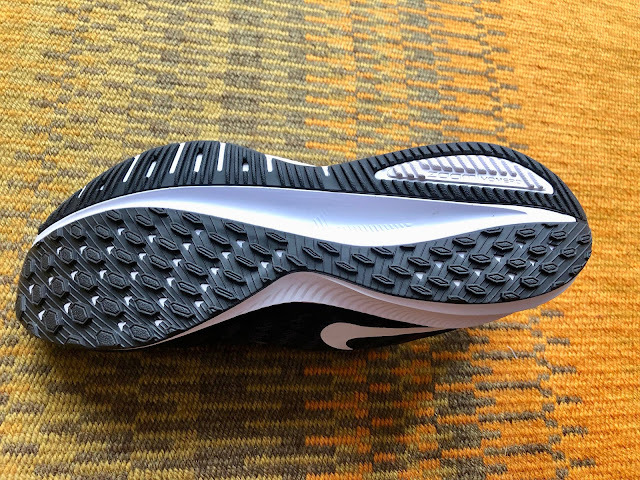 I find the width overall wider in Vomero 14 than Pegasus 35 but...if you have a wide mid foot you may feel the side walls especially when shoe is new. That feeling does mostly go away. V14 is available in wide on the Nike site which may be the way to go for you. Based on the description this sounds like a Peg 35 with react foam. React plus carbon which curves down as the Air does here . Peg 35 for me is stiff and dull. Here that new Air unit helps drive the foot forward and down to the thin but well cushioned forefoot which is flexible unlike Peg. The heel area is very stable reminding me of the Reebok Sweet Road 2 with some extra side walls A way more dynamic if a bit heavier shoe than Peg 35.